Effective communication is critical in building a work environment of trust and collaboration. Here are 3 tips for ensuring communication produces the culture you want in your organization. Much of our daily work requires at least an interaction with, if not a reliance on, co-workers to complete our given tasks. Workplaces are constantly changing and technology continues to advance, requiring employees to be flexible and adapt to the needs of the organization. This often requires employees to work outside of their area of expertise and with others across the organization. In today’s work environment, interpersonal interaction and communication with co-workers is essential for organizational success. The bottom-line is this: Communication is a skill. It requires active listening and the ability to articulate a message. And just like any skill, through practice, you can improve your ability to communicate effectively. Poor workplace communication often results in negative experiences across the organization. Water-cooler talk often ensues, leading to inaccurate information and gossip; which negatively impacts productivity, company culture, employee engagement, and morale. Such thoughts indicate a communication breakdown, often caused by poor communication processes and a culture that does not embrace open and candid feedback. In many cases, employees have good intentions but they do not understand the impact their words have on others inside the organization. People tend to hear what they want (or expect) to hear based on their own underlying beliefs and assumptions and not necessarily hear what the speaker was really trying to communicate. As a result, the speaker often walks away feeling misunderstood and the listener is none the wiser. We know we cannot control other people. There is no mind meld in which we can make people believe a certain way. In order to effectively communicate with others, we need to make ourselves accountable for the outcome of the conversation, putting ourselves in the driver’s seat of delivering the right message in the right tone. Foster accountability: When others see and hear effective communication, they will begin to take accountability in how they converse with others. Greater employee engagement: Clearly communicating your message allows your employees to perform at the level they need to, resulting in higher levels of employee engagement. Cross-collaboration: Interdepartmental silos are broken down, leading to increased productivity and performance. Building the right culture: The right beliefs are promoted in every conversation, leading to a positive workplace. Innovation: Conversations that were once unclear or nonexistent can lead to breakthroughs in offerings and processes. Developing talent: With open and candid communication, co-workers can provide effective feedback, both appreciative and constructive, that will help professional development. Employee morale and retention: When leaders communicate the right, clear message, employee morale increases. Discover how to take accountability for communicating more effectively. Check out our complimentary live and on-demand webinars. Many times we know what we want from another person but have not been clear with our own intention. For example, “my intention is to have a joint understanding following our conversation.” Or “I want this person to understand that I am right and they are wrong.” We need to recognize our goal. Are we trying to clarify or manipulate? We need to check ourselves and catch any hidden agenda before we begin. 2. Fill in the gap. Good rule of thumb: Assume the best, not the worst. 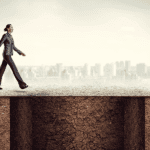 When we find there are gaps in information, we typically fill them with our own narrative. If we do not know something, we will make up the missing information. The problem with a negative story is that it can rile us into believing it. Thus, when we see that person, we re-experience our anger based on the story we invented. Best practice is to create a happy gap. 3. Change. We approach situations with the idea that change is good, as long as you go first. Or I will change, as long as its according to what feels good to me. The majority of people do not like change which can drive behaviors that positions ourselves in a place where we are not open to new possibilities. The tragedy is when we walk into a conversation thinking our way is the only way. It is limiting and not productive. Change requires us to have courage to take an unknown step. Allow change to be positive. It’s all in our perspective. 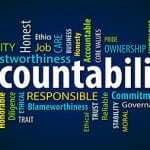 Personal accountability is about taking accountability for what we say and do. Ultimately we want the best for ourselves and others and we do that by becoming clear with our intentions before initiating a conversation. Once we are clear with ourselves, we can think the best before the worst. If we are missing pieces of information regarding others’ actions or statements, assume the best instead of jumping to the worst. Finally, be open to the possibility that there is always a solution. You just may not be seeing it yet. Keep yourself open to change and listen to others’ perspectives. When that happens, our options and possibilities expand and solutions appear where they did not before. 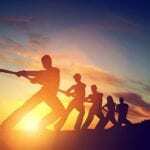 When people in your organization communicate and lead with accountability, water-cooler talk becomes conversations about our successes, not our shortcomings or discontent. Get certified to deliver the message of positive accountability in your organization.